This one was a bit of a stretch for me, but I'm so glad I pushed myself because we had a blast! We started by reading If You're Happy and You Know It by Jane Cabrera, which I actually sang. Only the second time I've done that. You would seriously never know it if you attended my ST, but if you had told me five years ago that I would regularly sing in front of people I would have started to cry. Anyway, love this book and we had a great time with it. Next I brought out the tub of rhythm instruments that's been mocking me for a couple years now. It was great! and NOISY! The kids listened to me really well, and we just did different things like fast, slow, quiet loud, up high, down low, etc. Then we moved into I Can Jump Jump Jump--a great action activity that really gets the wiggles out. 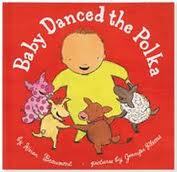 The second book that we read was Baby Danced the Polka by Karen Beaumont. I absolutely adore this one, and I really hammed up the refrain, "Did you hear what Mama told you? Did you hear what Papa said? It's naptime little baby so you BETTER STAY IN BED!" And the kids all joined in. 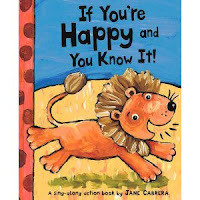 And what dancing storytime could leave out my beloved Watermelon Song? Not this one. 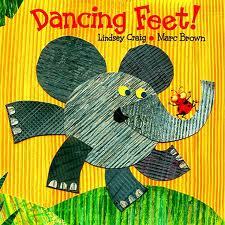 Because I planned so many extension activities we only ended up reading three books, and the final one was Dancing Feet by Lindsey Craig. I associated each animal with an action, so this one was boisterous too! And finally, I did something I've never done before, which was use recorded music in storytime. I handed out the dancing scarves and played sections of four different pieces of classical music. I told the kids to listen to how the music made them feel and how it made them want to move. I used the cd, "Beethoven's Wig 2" and chose four very different pieces of music--Light Cavalry Overture by Suppe, In the Hall of the Mountain King by Grieg, Humoresque by Dvorak, and the Blue Danube Waltz by Strauss. Then we played the opposite game with the scarves, sang our closing song, did hand stamps, and moved on to craft. For the craft, we made dancing wands using craft sticks. The taped a (precut) star onto the craft stick, colored it and taped ribbon and crepe paper on to twirl and swirl. I played music so they could try them out, and that was all.